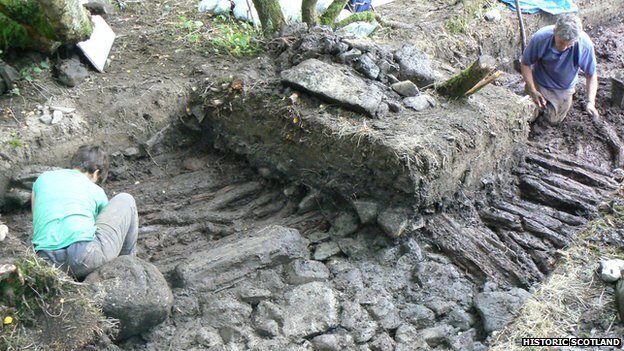 ROYAUME UNI – Black Loch of Myrton - Archaeologists have discovered the remains of an Iron Age "loch village" in Wigtownshire, the first of its kind to be found in Scotland. Experts believe it could be "Scotland's Glastonbury", a reference to the lake village in Somerset. The Wigtownshire dig was a small-scale pilot excavation of what was initially thought to be a crannog in the now-infilled Black Loch of Myrton, which was under threat of destruction as a result of drainage operations. However during the excavation, AOC - which worked on the dig in conjunction with local volunteers - discovered evidence of multiple structures making up a small village. What initially appeared to be one of a small group of mounds before excavation was revealed to be a massive stone hearth complex at the centre of a roundhouse. The timber structure of the house has been preserved, with beams radiating out from the hearth forming the foundation, while the outer wall consists of a double-circuit of stakes. The most surprising discovery was that the house was not built on top of an artificial foundation, but directly over the fen peat which had gradually filled in the loch. Rather than being a single crannog, as first thought, it appears to be a settlement of at least seven houses built in the wetlands around the small loch. This type of site is currently unique in Scotland and there are few other comparable sites elsewhere in the British Isles. Similar lake villages - including Glastonbury and Meare, which is also in Somerset - have been found in England, but this is the first "loch village" to be uncovered in Scotland. SRI LANKA – - The government of Sri Lanka last week has gazetted over 80 archaeological buildings in the Northern Province as ancient monuments. The National Heritage Ministry has gazetted 170 monuments island wide as ancient monuments and 83 monuments of them are in the North. A large number of monuments in the North have been identified as remnants of dagoba and other ruins around the sites such as pillar bases, brick walls, base stones, rock inscriptions, image houses and remnants of related building situated in villages in the Mannar, Mullaitivu, Jaffna and Vavuniya Districts. Director General of Archaeology Department, Dr. Senarath Dissanayake has said that research still needs to be conducted in the Vavuniya and Kilinochchi districts to identify possible archeological sites. CANADA - Banks Island - An archeological research project near Sachs Harbour aims to tell the human history of Banks Island, says the project's lead researcher. Lisa Hodgetts said the Ikaahuk Archaeology Project is looking at everything from population trends of muskox and caribou, to how and where people built their homes. "The first archaeological evidence for occupation on the island goes back about 3,500 years," Hodgetts said. "We're interested in how people's use of the land has changed through that time." The group looked at both Inuinnait (Copper Inuit) and Thule sites. The Thule are the ancestors of modern Inuit and Inuvialuit, Hodgetts said. The team has already made some interesting discoveries, she added. The first was found near Agvik, a group of sod houses about 25 kilometres east of Sachs Harbour. While the site was already known, Hodgetts said there were additional structures located inland that she believes are more sod houses. These houses were located near lakes rather than on the coast. "That surprised me," she said. "Previous archeologists who worked on the Agvik site just talked about them as features. They didn't actually come out and say these are houses. I think it's pretty clear that they are." Their location suggests people visited the site at different times of the year and for different purposes, such as fishing. At an Inuinnait site further east along the coast, the team found sik sik (ground squirrel) bones. Because sik sik don't live on Banks Island, the presence of bones suggests people transported the animals to the site from the mainland for food, Hodgetts said. The site also contained polar bear bones, including an entire polar bear skull that was found in a nearby cache. The team also explored two other Thule sites, including one near Cape Kellett, which is possibly the oldest Thule site in the Arctic, Hodgetts said. By studying animal bones, the team is also working on determining the rise and decline of muskox and caribou in the area. Hodgetts said that in some years, caribou populations are large while muskox populations are low then the trend seems to reverse. Geophysical instruments, including a magnetic susceptibility meter, were used to gather information about the sites without doing excavation work. The instrument finds variances in magnetism in the ground, which can be detected in areas where campfires or garbage dumps were once located. "They measure really tiny differences in magnetism, kind of like a super-sensitive metal detector," Hodgetts said. "They find not just metal, but anywhere that people have done something that might influence the magnetism of the soil." 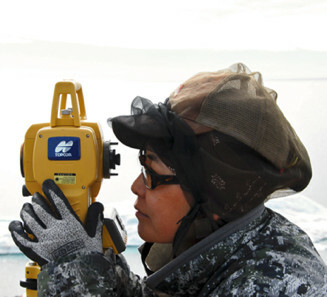 Pokiak learned how to use the equipment, including a total station instrument, which is used to calculate distance and angles. The information is being used to make 3-D maps and models of sites and artifacts.